Dramatically reduced path to getting started with PmWiki. Is there a better alternative to JumpBox for the PmWiki Wiki Software? Is JumpBox for the PmWiki Wiki Software really the best app in Servers category? 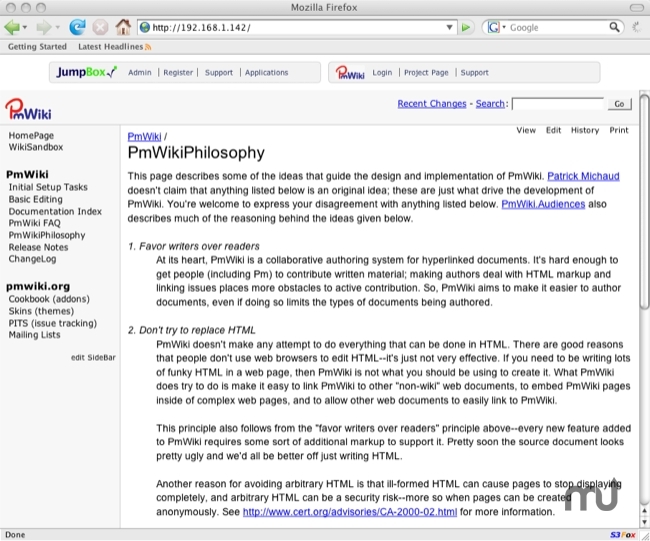 Will JumpBox for the PmWiki Wiki Software work good on macOS 10.13.4? JumpBox for the PmWiki Wiki Software is a plugin for the wiki-based system for collaborative creation and maintenance of websites, PmWiki. PmWiki pages look and act like normal Web pages, except they have an "Edit" link that makes it easy to modify existing pages and add new pages into the website, using basic editing rules. PmWiki is a clean and simple wiki system with a friendly user interface made easily deployable with the JumpBox for PmWiki. Many upstream updates from Ubuntu. The kernel is now updated to the backported Natty kernel to resolve the ESX 4.1 issues some users were still experiencing. JumpBox for the PmWiki Wiki Software needs a review. Be the first to review this app and get the discussion started! JumpBox for the PmWiki Wiki Software needs a rating. Be the first to rate this app and get the discussion started!